After leaving Nashville, we headed south to Melbourne Beach, Florida to spend the next few months. We knew that once we were done working at Amazon, we would need to recharge, relax and get warm. On all three counts, we were correct! In hindsight, we were glad that we left Kentucky when we did, as the weather turned much colder after we left (it is 15 degrees in Campbellsville as I write this, as compared to 72 degrees here in Melbourne Beach). We’ve toughed out a winter in Michigan and know what it takes to do it. Even if it was just until Christmas, we really didn’t want to do that again. On top of that, Diana’s back is better, so we are both very happy about that. On the way down, we logged our very first ‘Wallydocking’ experience in Cullman, Alabama. For those of you unfamiliar with this term, here is what it is all about: If you’ve ever driven by a Walmart, you’ve probably seen RV’s and trucks parked out at the far end of the lot. Where local ordinance allows, Walmart allows people to park overnight. It’s best to check with the store manager, and it is only proper to buy your groceries from them in return. We popped out our bedroom slide room (it only extends 21 inches) and slept just fine. The best part for us is that we didn’t have to pay a campground fee that night, since we were just traveling through. We had plenty of water for our showers, our furnace kept us warm, and Diana was even able to bake blueberry muffins in the oven! Although we had overnighted off-grid at several Harvest Hosts locations in the past, this one stop really hooked us on the idea of boondocking more in the future. Many of our fulltime RVing friends spend significant amounts of time off-grid in beautiful locations in the western U.S., and we would like the capability to be able to do that. More on that later in the post. Later in the trip, we returned to Golden Acres Ranch, a Harvest Hosts location in the panhandle of Florida that we have visited twice in the past. We loaded up on their Mayhaw and blueberry jelly, as we had run out about three months ago of our purchase from the previous visit. 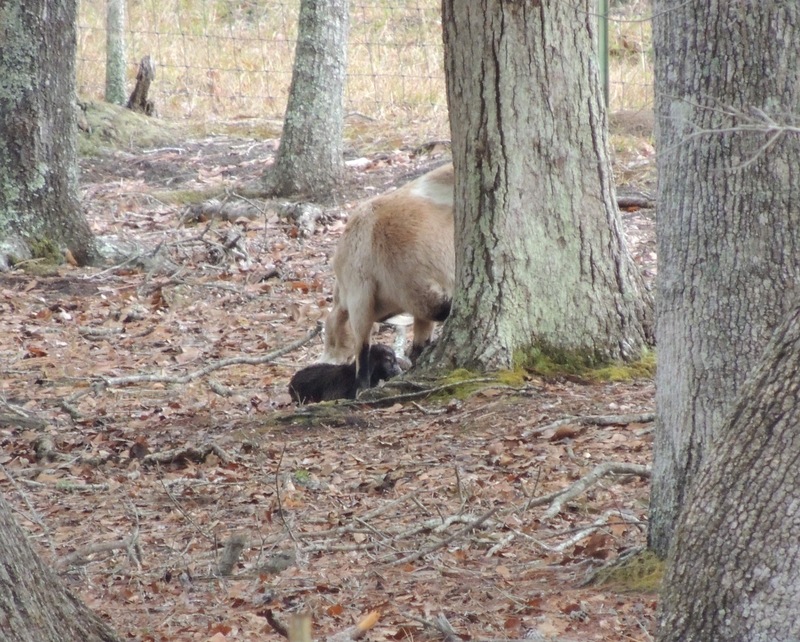 While we were there, a couple of their goats gave birth…one to twins! 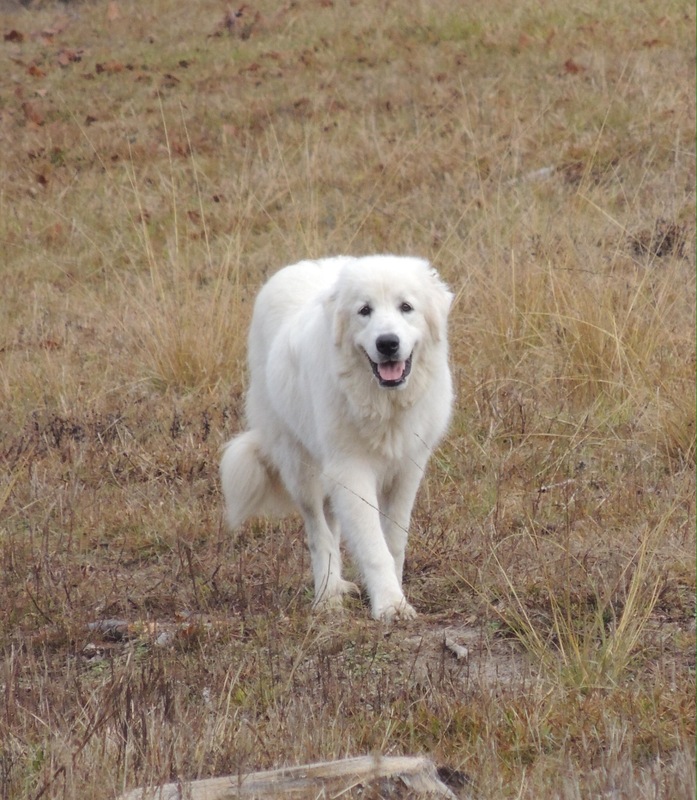 It’s always good to see their Great Pyrenees dogs that roam the property and protect the livestock. They remind us so much of our Golden Retriever, Dakota. We are convinced he must have had some of this breed in his bloodline. We also used our Passport America membership and saved 50% on four nights worth of camping at two locations on our way down. Those were both full hookup sites spaced between our Walmart and Harvest Hosts sites, so our battery was able to be recharged and our tanks were able to be dumped. While staying at our last location just south of Ocala, we visited with Diana’s brother and also our niece and her family. We arrived back at Melbourne Beach Mobile Park on December 11. Instead of fighting Orlando traffic, we tried something a little different. 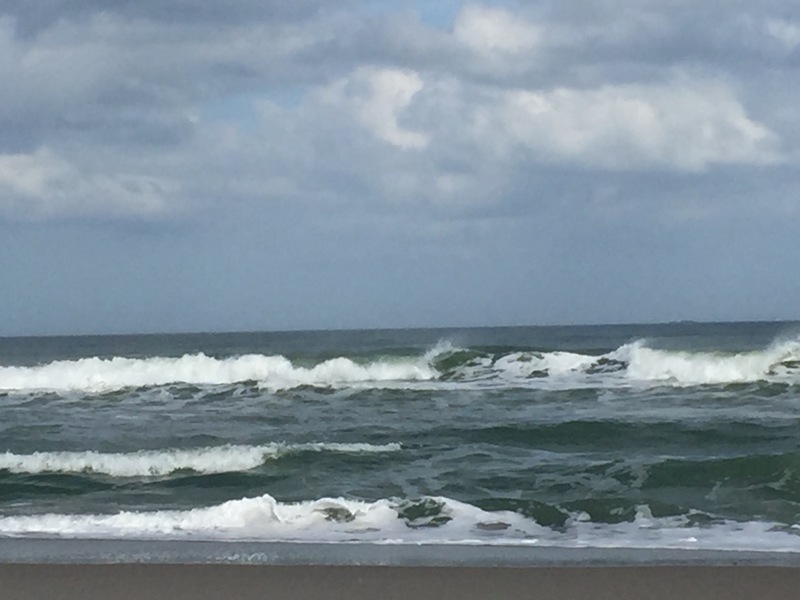 We went north 15 miles to Silver Springs, then straight east to I-95 near Ormond Beach, then south to Melbourne Beach. 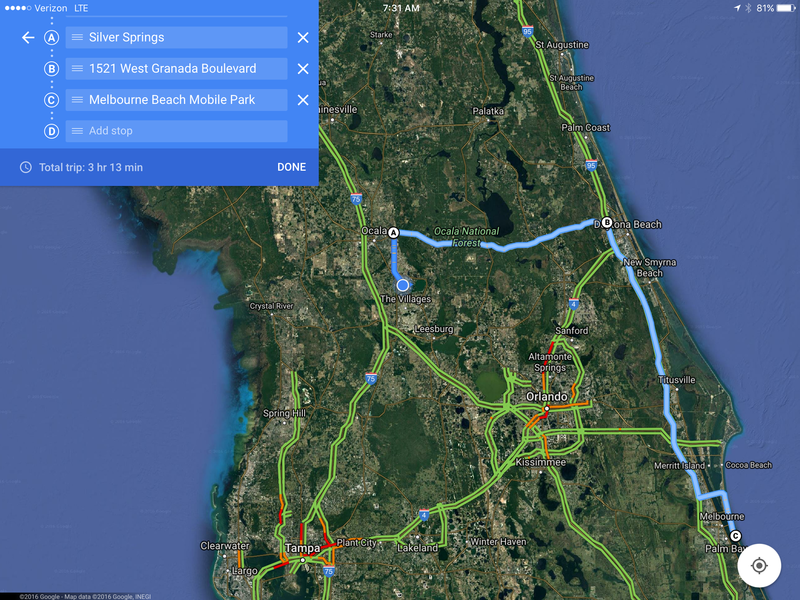 Except for a little traffic near Daytona Beach, the route was a breeze. It definitely beat going through Orlando! 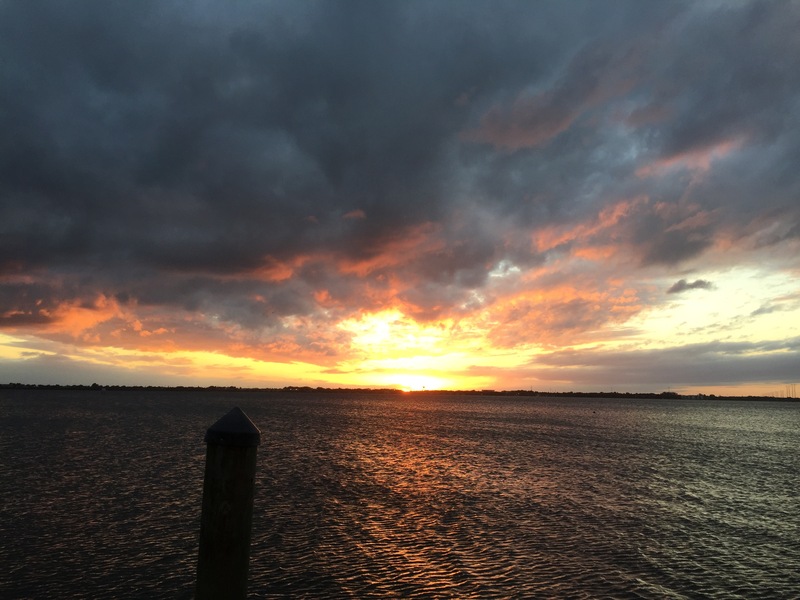 …and the peaceful Indian River Lagoon on the west side. It’s a great place to catch not only sunrises and moonrises, but also sunsets and moonsets. 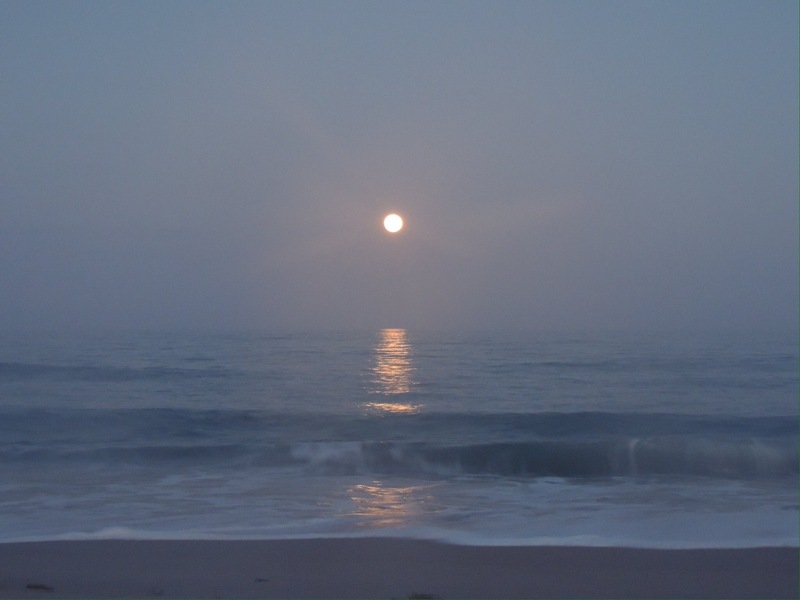 😃 This was the full moon rising over the Atlantic the other evening. So I spoke earlier about doing more boondocking (camping without being connected to electricity, water, or sewer) this year. Let me go into a bit more detail on that. Our rig is currently set up as it came from the factory, meaning the off-grid electrical system consists of one 12 volt deep cycle battery powering most of the lights, the water pump, and the furnace blower. All of our light bulbs are incandescent or fluorescent. When off-grid, the refrigerator can run off propane, as can the water heater. Our fresh and waste water tanks generally last a few days without any conservation efforts. In essence, we wouldn’t really need to do anything different if we were alternating between boondocking and full hookups. But, as many of our fulltime RV friends have done, we want to enable ourselves to stay off-grid a bit longer. Our first thought was that we would be limited by our tanks as to how long we could boondock, but there is nothing saying we couldn’t go service our tanks at a dump station and head right back to our same boondocking campsite. That makes our limiting factor electrical. First and foremost are replacing those incandescent bulbs. We bought 10 pack of T-10 LED 12 volt bulbs for $20 at Amazon. We also replaced the bulb in our 120 volt lamp near our recliners. On top of that, we bought a Kill-o-watt 120 volt meter and a Bayite 12 volt multimeter to allow us to do an energy audit to see just what our needs are. Our battery is the same one that came with the rig when we purchased it in 2011, so it is definitely near the end of its lifespan. The energy audit will allow us to figure out how big of a battery bank we want to get. After that, we want to string some days together off the grid before we decide what future upgrades we want to make. We would like to run our computer, charge our iPhones and iPads, and maybe watch a little TV. Not a lot more than we currently are able to do, but enough to warrant some sort of upgrade. We also purchased an Oxygenics shower head to conserve water. We plan on doing a bit of traveling after we leave here, so we are also using this time to do some maintenance. I definitely want to pull all the wheels off on our vehicles and check the brakes and bearings. The fifth wheel also hasn’t been waxed in a while, so I’ve started on that. Look at that shine! 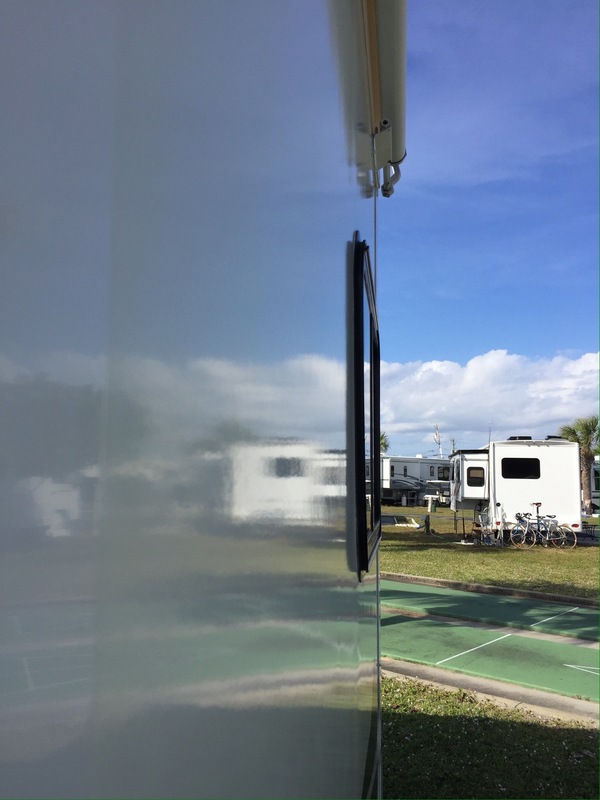 We use Meguiar’s Marine/RV Fiberglas Restoration System. With our rig being a little older, the oxidation remover really does the trick on the dull, chalky look. The secret is to work in the shade, as direct sunlight tends to leave an uneven finish. So that’s a little review of our trip to Florida and a peek into what we have planned the next few months. Diana has been busy mailing Christmas cards, and I have put up lights and other Christmas decorations. As they say, “Home is where you hang your lights!” Wishing all of you Merry Christmas, Happy Holidays, and an adventurous New Year! 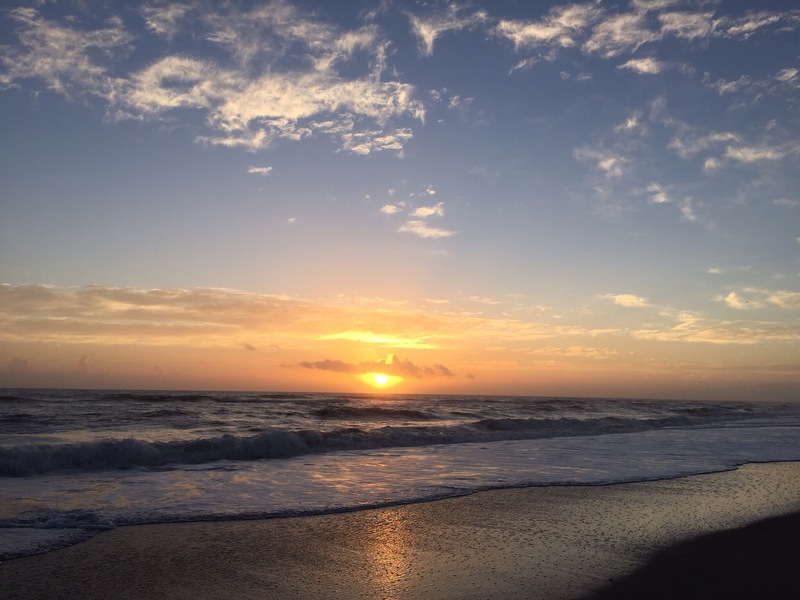 Previous PostNashville, Nostalgia, and Nudie’s!Next PostChristmas Eve – Cocoa Beach Style! Sounds like a nice trip, Jim. I’m glad you’re giving careful thought to exactly WHAT to do about your future energy needs. Understanding how you live is critical; as well as growing in an understanding of how you’ll NEED-TO-LIVE with solar/battery power. It’s not a intuitive growth path. Big difference in the side of your 5’er! looking good! Exactly, Peter. We definitely do not want to overbuy. Agreed on overbuying. We have walked in slowly and now know what we need to live like we want to. We have saved ourselves a bunch of money in the process. Can’t wait to get to FL and warmer temps! I’m VERY tired of this COLD! The floors are cold – we have area rugs in the linoleum that helps but we don’t walk around without socks/slippers! I’m sure skirting would help but we aren’t in one place long enough! And yes – I am a very lucky lady to have a handy guy like Bill! So glad to hear Diana’s back is better and you are relaxing where it’s warm. Merry Christmas to you both and a beautiful New Year! It’s always nice to read about someone staying where you’ve been. Melborne is a nice choice this time of year. What we enjoyed was that there are so many beaches, you can find some busy and some empty, so you can find the right beach for you. Thanks for the waxing tips!! Hope you’ve tried The Blueberry Muffin restaurant there, cute place! Diana has been wanting to try it for awhile now, Chrissy. We haven’t gotten there yet, but we for sure will! Looks like the perfect place for a little R&R! You project list is getting as long as ours! I like your approach to boondocking, I think you will like it and it gives you a lot more freedom. Jim – when we are in Key West we boondock for a month or more. Here is a link to our Boondocking page to see what we use. We recently purchased a small solar panel and I’ll let you know how that works out after the Christmas holidays. The ability to boondock or dry camp definitely gives you more flexibility. It was definitely a good time to get south! Can’t believe the temps in Campbellsville for all next week – no thanks 🙂 Glad you were able to make your HH stop again – that dog is beautiful. Our residential frig makes boondocking without solar more challenging, but we’re hoping to get more off-grid stops in next year to expand our location options. I’m looking forward to seeing what other changes you make. You two have a wonderful holiday and enjoy the warmer temps!! I shudder at the thought of how much propane we would have burned in Campbellsville, Jodee. Amazon wasn’t paying for that! We do have an inverter but not a decent battery monitor – just a dummy light like the tank levels. We’ve dry camped for four days in mild weather with two 1 hour genny runs each day and done well – but we really need a monitor so we can tell exactly what uses watt 🙂 Since folks dry camped for decades without solar I think it can be done even with the frig and our four batteries. Thanks for the link!! If you haven’t purchased a monitor yet, let me get mine hooked up this week and see what I think of it. Technomadia uses a more expensive monitor than what we bought. I really didn’t want to sink $170 into a battery monitor…let’s hope mine works! You definitely made a great decision to leave Kentucky this year. It’s been cold everywhere but Florida it seems along the east. We’ve stayed in many Walmart’s and Cabela’s when we only want a one night stop over. They work out well. A little tip for your Walmart choice…check to see if there is a Starbuck near by. This will tell you the type neighborhood your Walmart is located in. We had a scary experience in a Walmart near Cleveland and left shortly after arriving. We have since realized that every nice Walmart seems to have a Starbucks within a mile and the area was much safer. We can boondock with our residential refrigerator since the newer models use so little electricity. But we do have a generator that we run for a couple hours in the morning and then a couple in the evening. You didn’t mention a generator so I am assuming you don’t have one. Maybe that purchase would really extend your boondock desire!? Enjoy your winter in Florida! Jim & Diana, We are wintering in Louisiana, Melbourne Beach looks like a great place to rest and recharge. We were near (Mims) last summer and had our anniversary dinner at the Dixie Clipper, the Rock shrimp were amazing. Definitely worth a visit! Great to hear from you, Mike! We may get up towards Mims this year, as there is a couple of bike paths up that way. Thanks for the tip!